One of the newspaper articles that caught my eye this week was this one which says the savings rate in America is the lowest it has been since the Great Depression. It seems that most people are living beyond their means, living check to check to afford modern conveniences. It makes me wonder what will happen when the next big economic downturn comes. How many people will have their houses foreclosed upon and their home theatre systems taken away? This article validates my desire to save as much as I can and reduce my debt as much as possible as soon as possible. In other news, I had to return my Emerson Nostalgia Audio System. Actually, I returned one the first day because the platter was warped and would not play the records properly. The second one I had for just over a month and was in the middle of playing a record when it stopped. If you spun the platter, it would play but it wasn't revolving at the correct speed and didn't sound right. I took it back to Office Max, who refused to give me my money back as it had been over 14 days, but "did me a favor" by refunding the purchase price as an Office Max "gift card." So instead of having money, I have scrip that I can only spend at the company store. I guess the moral of the story here would be something to the effect of "don't buy stereo eqipment at an office supply store" but it could also be "that whole thing about the customer is always right is total BS." Does this look like a bomb to you? 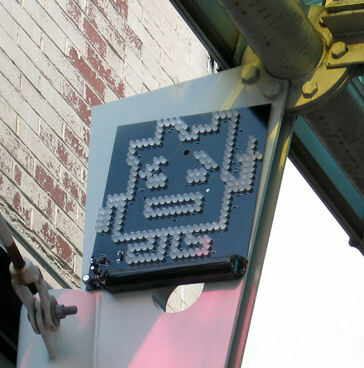 In one of the strangest news stories ever, and one that oddly resembles an episode of the show that it is was trying to promote, the city of Boston was put in lockdown over several small blinking signs portraying Ignignokt and Err, characters from the Adult Swim cartoon Aqua Teen Hunger Force. The authorities shut down large sections of the city while defusing these "hoax devices." Two men, Sean Stevens and Peter Berdovsky, self-styled artists who were in the employ of New York-based viral marketing company Interference, Inc. were arrested in connection with the art installation/phenomenology experiment and face charges of placing a hoax device in a way that causes panic and disorderly conduct. The two have plead not guilty to the charges and mocked the media at their press conference. Outside the courthouse, supporters protested their arrest, and handed out flyers portraying Ignignokt and Err saying "1-31-07 Never Forget." Now I have to admit that I am a long-time Aqua Teen fan and instantly recognized the characters. If I was someone much older who did not know anything about the show, would I think a blinking sign like the one above was a terrorist device? I can only speak as someone who knows what the sign represents, and I think that it is a huge overreaction by the government, which has been whipped into a frenzy of "readiness" by the so-called media who find it profitable to keep the public in a state of fear over terrorism. As Carl, another ATHF character once said, "Is this not America?" On the other hand, to my cynical media-jaded mind, this little misunderstanding, no matter how much the corporate folks who hired these guys may grovel to the media, they sure got a lot of people aware not only of their cult cartoon but also of the fact that a movie, Aqua Teen Hunger Force Colon Movie For Theatres starring these characters is coming out soon. So are these two artists the newest casualties in the post-9/11 assault on our civil liberties or are they being paid by a corporation to take the fall like post-post-post modern Lee Harvey Oswalds?